LA-320, Large diaphragm condenser tube microphone from Lauten Audio in the Series Black series. 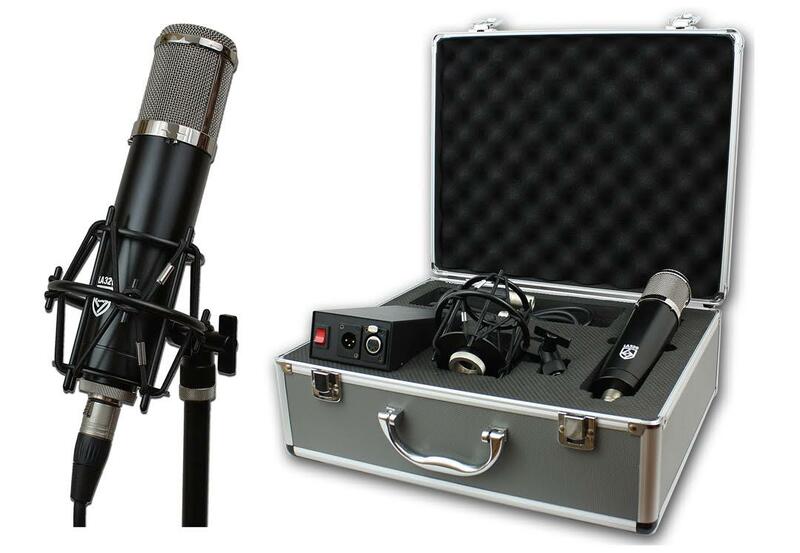 The LA-320 is a pressure-gradient, vacuum-tube condenser mic, with a fixed cardioid pattern. The transformer-balanced mic features low-pass and high-pass filters built into it (more on those later) but no pad. It comes in the kind of briefcase-style hardshell case that is typical for quality microphones. It provides the mic with a padded environment to be stored in and carried, and also features room for the mic’s basket-style shockmount, power supply and power-supply-to-mic cable. The black colored LA-320 is about 9” long, and securely screws into the bottom of the shockmount. The threads seem to be a standard size, as they also fit my Mojave Audio MA-300 tube mic. The power supply is roughly 6.5” x 3.5”, and features a detachable IEC power cable, on/off switch, and mic jacks for the 7-pin included cable that goes to the mic, and the standard XLR cable (non included) that connects to your mic pre or interface. The power supply has a voltage selector switch, which can be set to match the power in the country you’re in. Spec wise, the mic has a 20Hz to 20kHz frequency response, and an SPL rating of 130 dB, which is pretty typical, and should be plenty high for studio needs. I tested the LA-320 on a variety of sources. I recorded the examples into Pro Tools through an RME Fireface 802 preamp. I used a little bit of reverb on some of the examples and a tiny bit of compression on the vocals. No EQ was used. Next, I tried it on sung vocals, and here I was really impressed. The tube character of the mic was particularly apparent, in a good way, in this application. The mic's frequency response graph shows a presence boost at about 9-10kHz, which helps make vocals sound polished and warm. If you find it’s too bright, you can turn on the low-pass filter, which has a rolloff starting at 12kHz and going up to 20 kHz from there, with a fairly steep slope. Having the low-pass filter was helpful when I recorded an F-style Eastman mandolin, with the mic about 8" away. Without the filter, it was a little harsh when capturing the high strings, which are bright to begin with. Once I engaged the filter, though, it sounded quite good. In this example, the same chorus from an old fiddle tune is repeated. The first time is without the low-pass filter and the second time with it. Next up was acoustic guitar, and this time I used the high-pass filter to keep out the boominess of the low strings. The filter’s rolloff starts at 120 Hz and goes down to 20 Hz, with a slope that appears, from the diagrapm, to be more gradual than the one for the low-pass filter. Next, a strumming part on the same guitar. I was quite impressed with the LA-320 ($499), not only for its warm sound quality, but for its versatility, as well. Here is a mic you can use on a pretty wide range of sources and be confident of getting good results. Like with any tube mic, there may be some situations where you'd prefer a cleaner solid-state mic instead, but I was hard pressed to find an application where I wasn’t happy with the results. Yes, it’s a bit hypey in the high end, but in a good way — vocals that I recorded during my testing sounded consistently bright and present. Because it has a low-pass filter, you can roll that brightness off to some degree when needed. Having both high- and low-pass filters makes it possible to tailor the LA-320’s sound to the source or the room acoustics. What’s more, it seems solidly built and it comes with all the requisite accessories you’d expect from a mic of this type. It may be on the low end of the price scale for tube mics, but the LA-320 can hold its own sonically with mics that cost a lot more. Nice job, Lauten Audio.